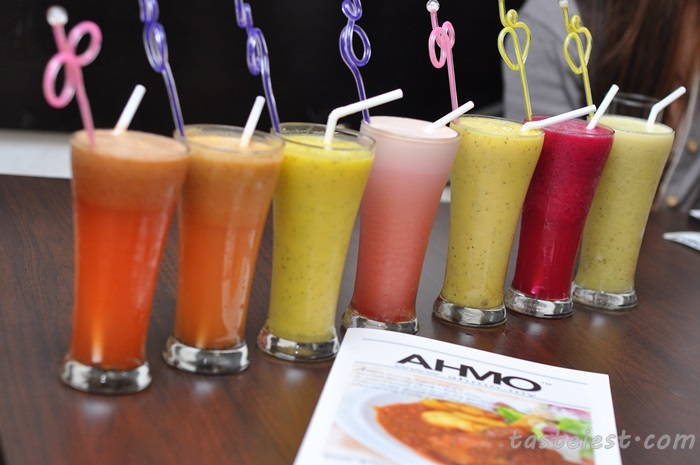 AHMO Western Food Restaurant located at Irrawady Road established since 2 years back and I have long heard about their great food but never have a chance to try it out. 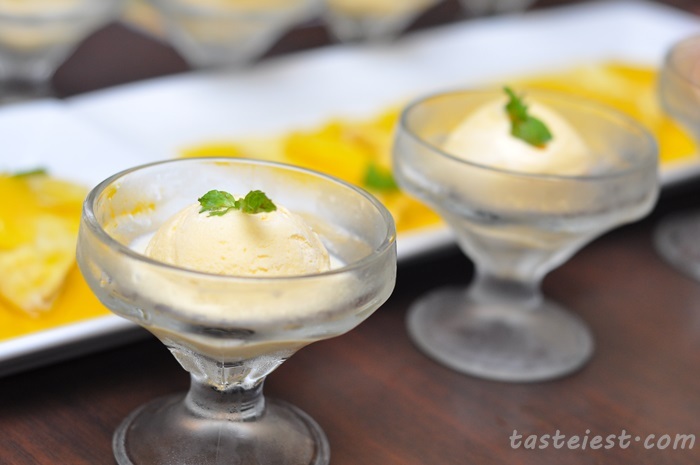 The chef has over 40 years culinary experience and working in major hotel before, great skill in preparing western food. 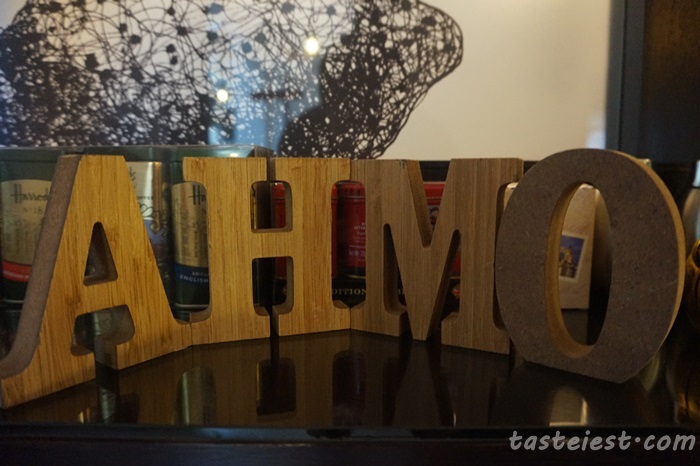 AHMO is a simple and easy to remember name, local people like to call foreigner especially white guy “Ang Mo” hence they decided to use something common and easy to remember as they shop name. 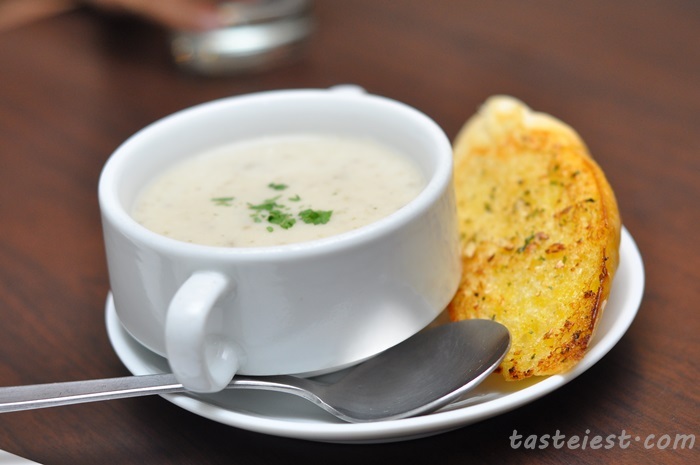 Shitake Mushroom Soup RM6, mixture of assorted fresh mushroom for a cup of creamy soup. 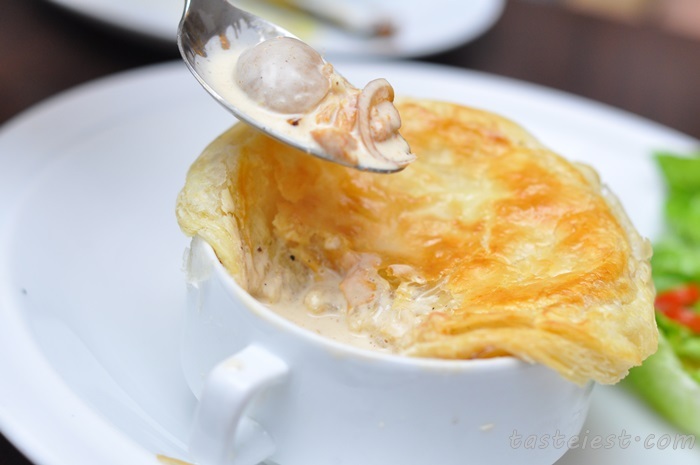 Escargots a la Bourguignonne RM25, can someone teach me how to read? my tongue just can’t work out. 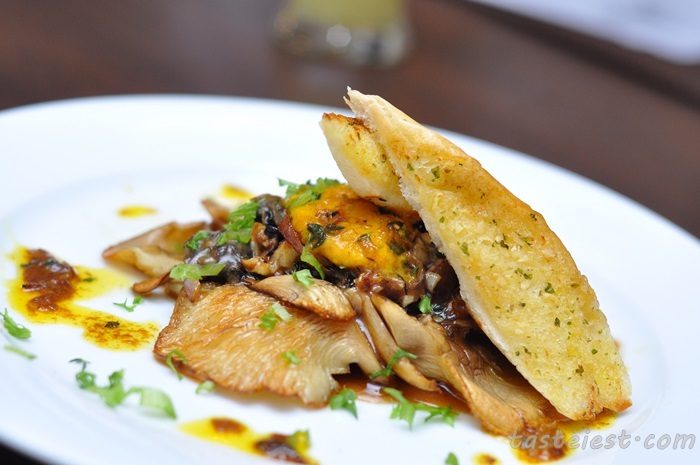 Anyhow, Escargots is a dish of cooked land snail origin from France, served with mushroom and garlic bread. Snail has a little bit chewy texture but the sauce is nicely done to cover any “unwanted” flavor from snail, surprisingly i like it. Soft Shell Crab Spaghetti RM25, one whole soft soft shell being added to this plate of spaghetti. 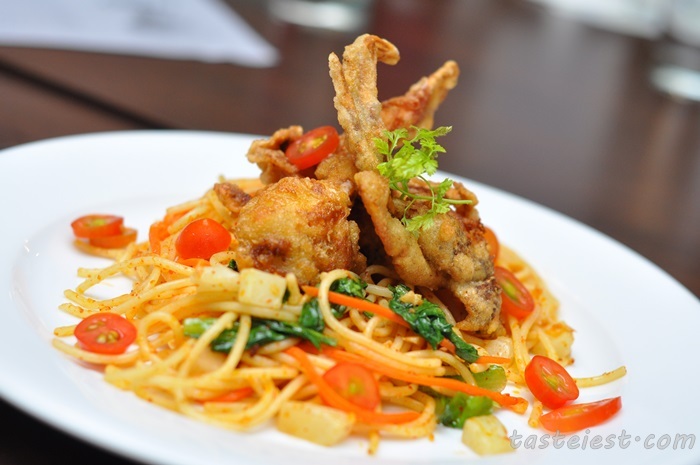 Soft shell crab perfectly deep fried to crispy while maintain juiciness of crab meat inside, spaghetti fried with oil, chili and tomato. 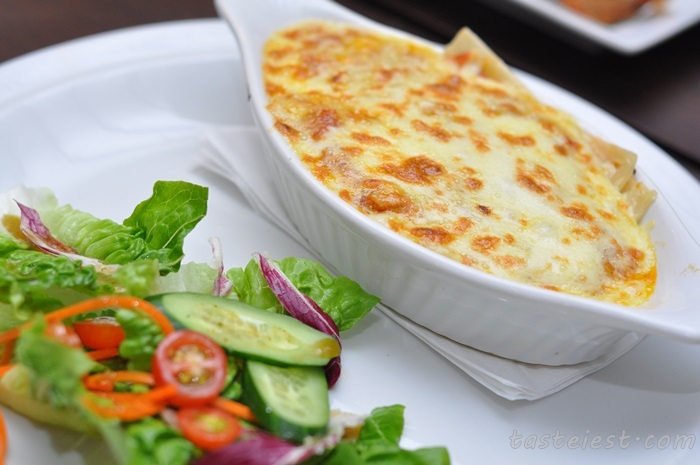 AhMo Lobster Thermidor RM138, one of AHMO signature dish. Honestly, this is the first time i ate Lobster in western food restaurant as normally i eat lobster at seafood restaurant. Chef extract the lobster meat and cook with onion and cheese then baked. 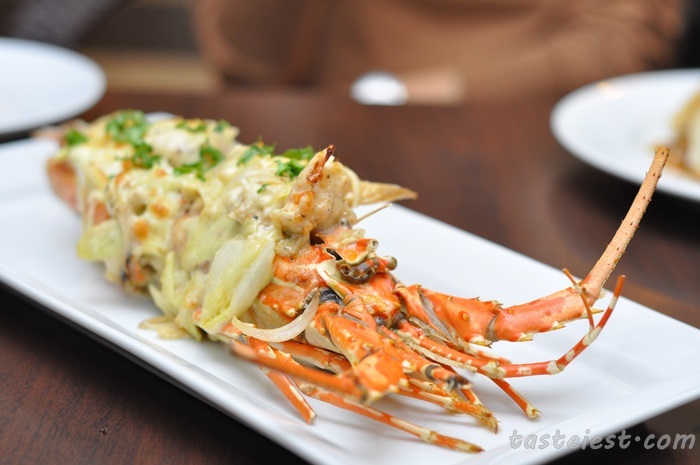 The lobster meat is nicely done to tender texture and the sauce is not over power as well. For just RM138, “everyone can eat”. Foei Gras Burger RM28, every time I heard of Foei Gras I would expect to pay a premium but in AHMO you can eat Foei Gras Burger for just RM28, rather reasonable price. 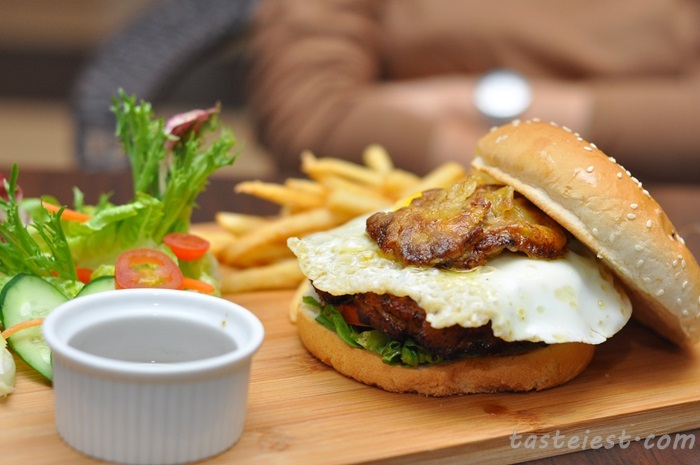 The overall burger taste pretty good especially the patty meat that is moist and flavorful but honestly i can’t really taste the Foei Gras as the thin cut Foei Gras just over power by the patty and egg flavor. 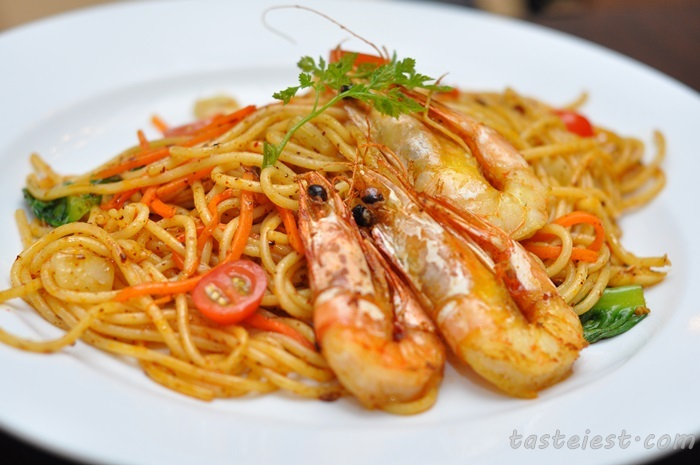 Prawn Olio Olio Spaghetti RM18, a little bit spicy taste spaghetti served with 3 white prawn, spaghetti is nice done and the overall texture and taste is pretty good. 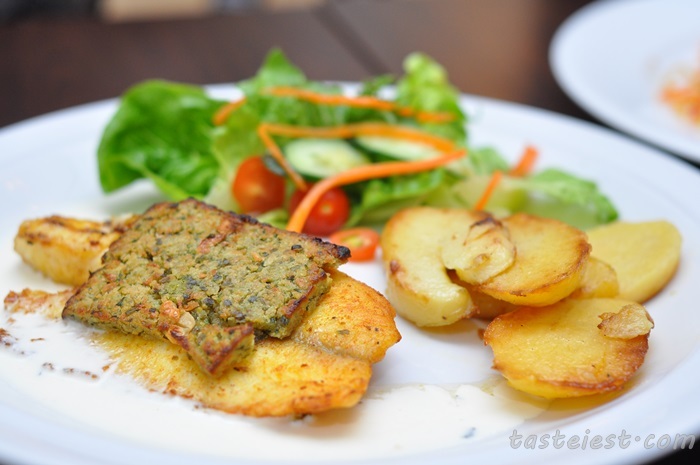 Fish Capers Beurre Blanc RM18, two piece of fish fillet served with salad and potato. Fish is nicely grill and juicy while the add on sauce has a hint of lemon. 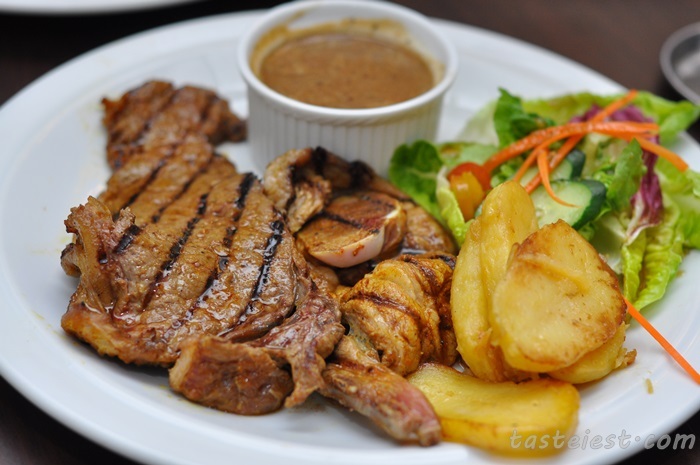 Steak & Lamb RM35, a big portion of protein for those meat lover like me definitely will enjoy this plate to the max. 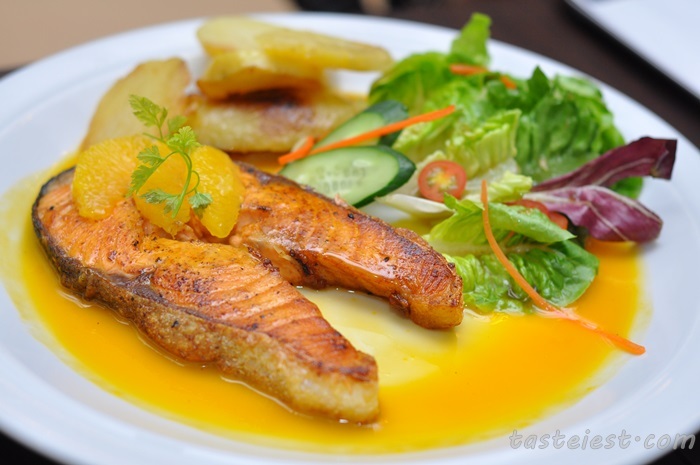 Grilled Salmon RM29, topping with orange sauce that taste sweet with mild sourness. 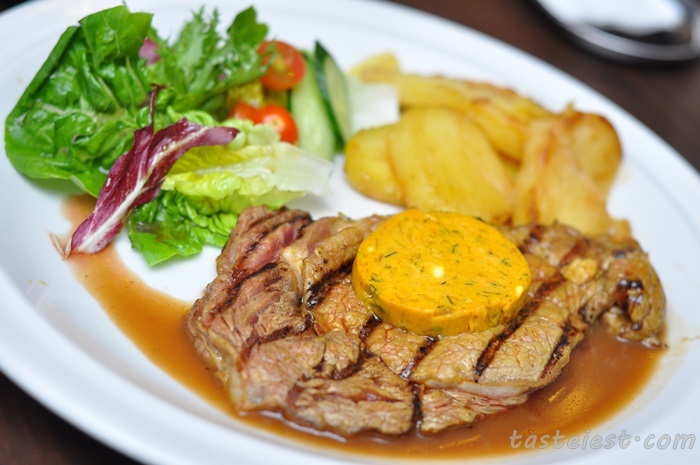 Ribeye Cafe de Paris RM38, I found the Ribeye to be chewy as the tender is not properly taken care of. 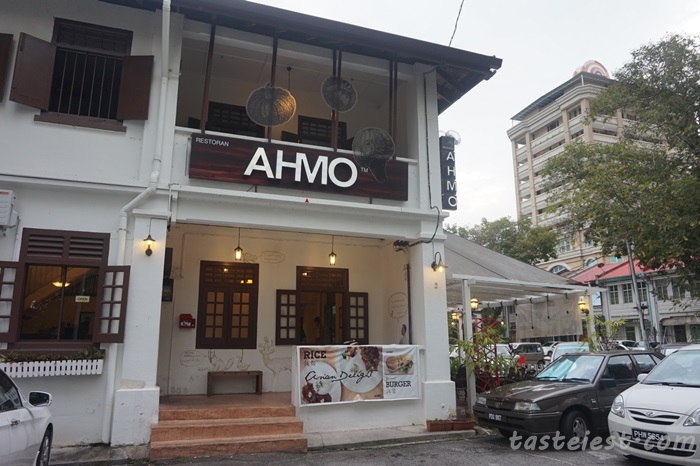 AHMO Lamb Shank RM36, how to resist Lamb Shank? Every time I saw lamb shank, I must order. I am lamb lover, i just love to eat lamb, i love lamb so much. HaHa! 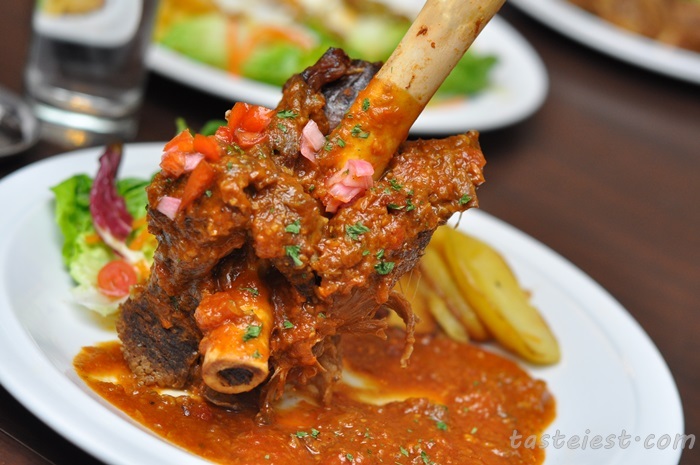 Lamb Shank are oven cook or deep fried before they top with gravy as the lamb shank has a crispy layer, the sauce is nicely done to flavorful, lamb is soft and delicious. 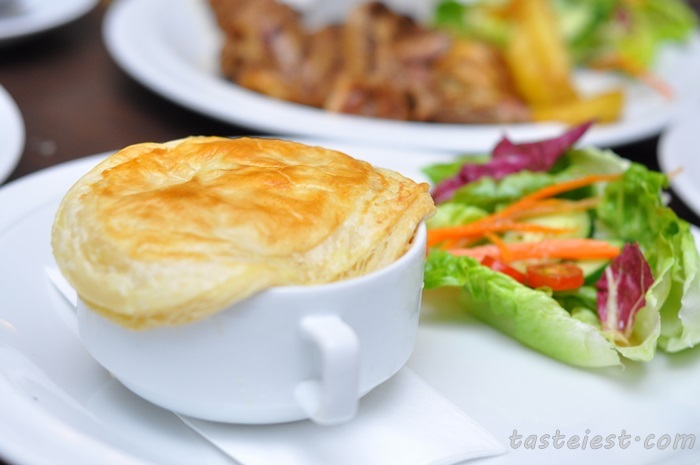 Chicken Pot Pie RM20, a mixture of mushroom, chicken meat and vegetable cook in creamy sauce then baked with pastry on top. 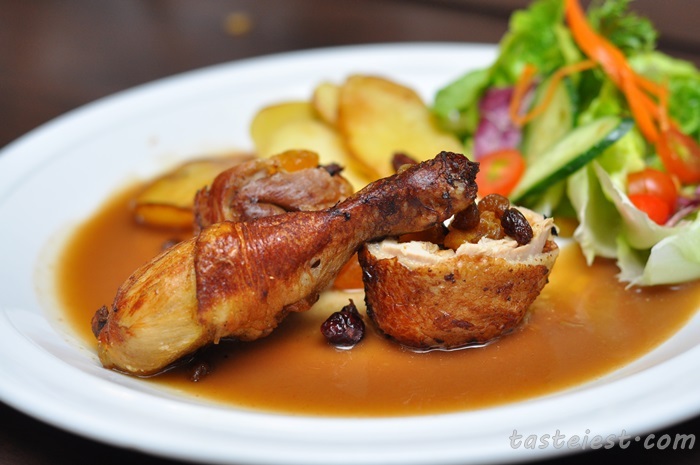 Apricot Chicken RM19, chicken drum stick fill with dried food then deep fried to perfection, the chicken meat has the sweetness from dried food. 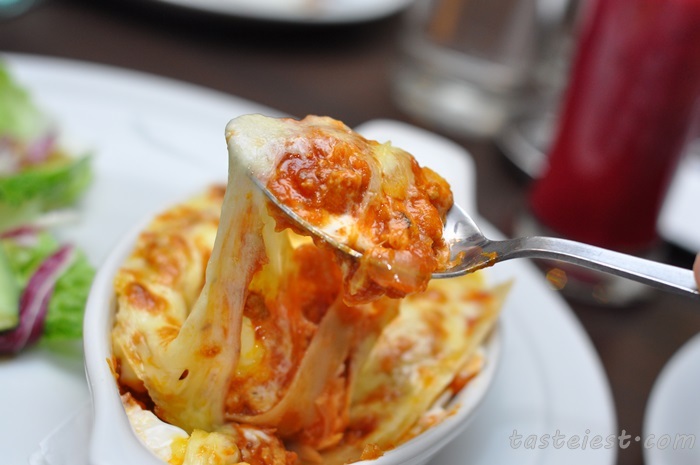 The portion is a little bit small for big eater but for sure a satisfactory portion for ladies. 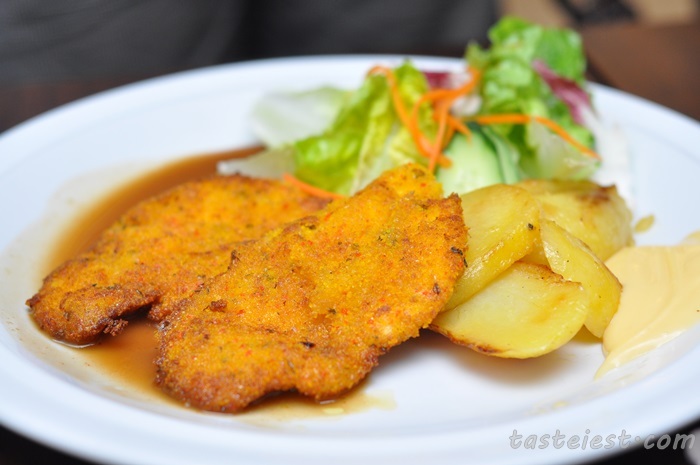 Chicken Schinitzel RM15, thin cut chicken breast deep fried to golden color and top with brown sauce. 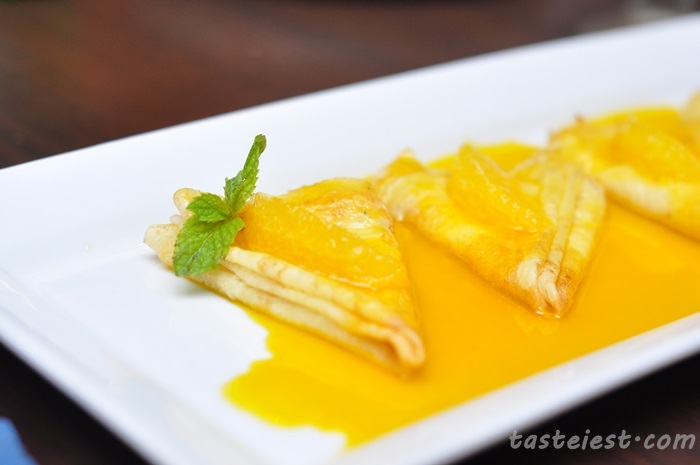 AHMO Crepes Suzette RM13, we taste the same dish in Ferringhi Garden before way it was way too sweet, in AHMO the sweet sauce is well balanced, not too sweet with a little bit sourness. It served with a cup of Ice Cream. *Picture shown are portion for four. 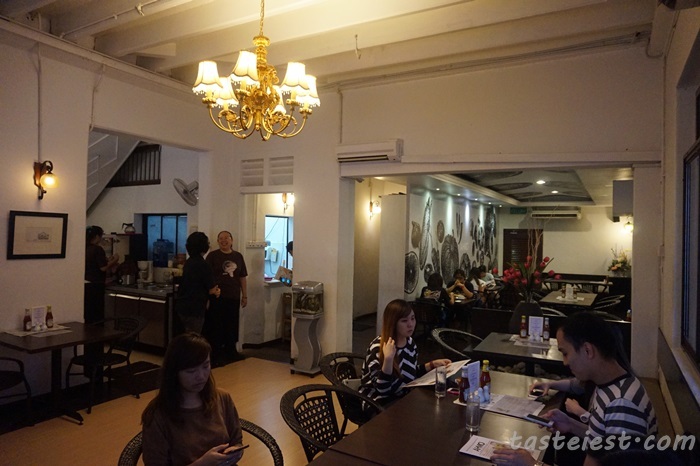 No.2, Jalan Irrawaddi，10500 Georgetown，Pulau Pinang.